You feel a bit tired so you need a small encouragement which lets you have a look into your mirror. What do you see? You’re an effect artist. What a coincidence!! Because this article could be interesting for you. But particles don’t like to be alone so mostly you let your particle system emit a lot of them. With that you try to hide the fact, that you’re starring at a bunch of polygons. In combination they look more complex than they really are (especially when they move). The fire sparkles are not oriented randomly but into their moving direction! The fire sparkles are stretched depending on their speed! The fire sparkles burn where they hit the ground and create a new smoke effect. This means there’s a collision detection – and we don’t talk about GPU calculated PhysX here! Last but not least: The core of this effect is a fire stream which isn’t built out of a massive amount of particles. This is awesome, because the stream never interrupts even when the tank would rotate very fast! But how is the stream done? Here you can see the stream and how it deforms when the stream source is moved. Looks really neat to me!No single particles are visible. Guess what the whole thing is made of? It’s a geometry. At first i thought a texture is moved along it but a close look reveals that the geometry itself is moved (especially visible at the end then the whole thing stops).I’m not 100% sure but i guess they colorize it via vertex colors so that the upper part gets first reddish and then fades out. If you think that this remembers you on something, then you might already read my Homeworld Trails article. The Relic effect engine is very powerful and if you want to know more you should have a look on this presentation. Thanks at Ryan Pool for his help, ansers to my questions and his really cool CoH World Builder tutorials. 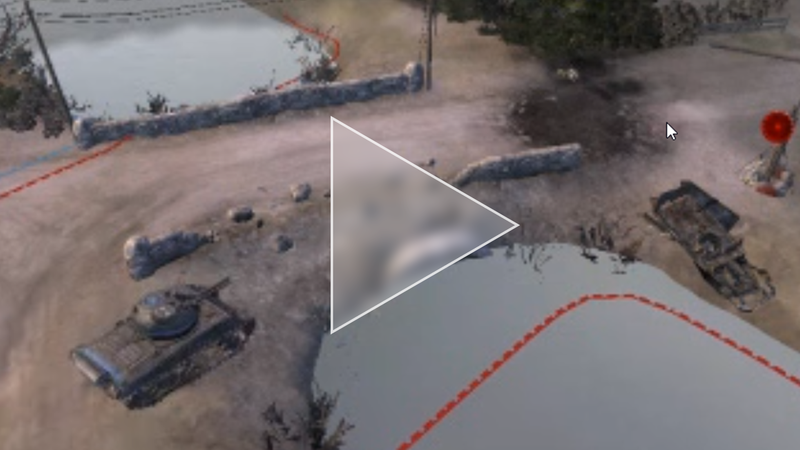 This entry was posted in Game Art Tricks and tagged Company of Heroes, Flamethrower on 20. August 2013 by Simon. YAY! Thank you! This is a really great article! Relic has some tremendous effects in their games and it’s awesome to see how they do it. 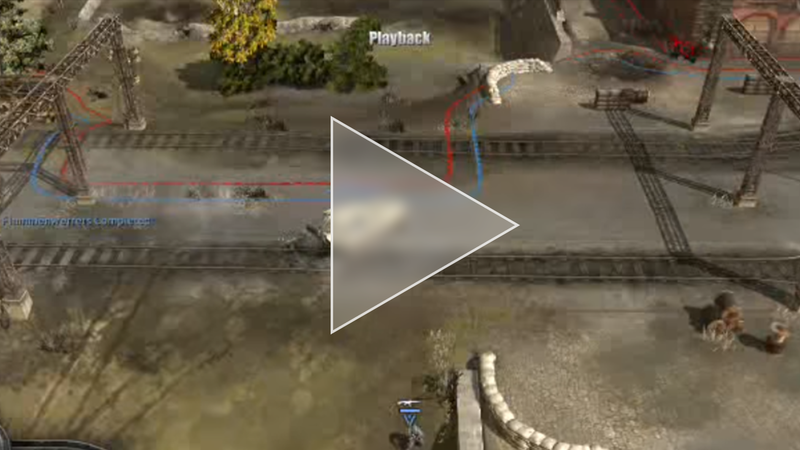 Hmm.. Well I think the CoH flamethrower effect is nice… but would easily been done way better! * fire is not only additive! In the CoH fx I see no grime when the flames dissolve. Look here: youtube.com/D9DkciMTsLI black smoke coming immediately from the flames. Of course motion is always tricky to fake properly without fluid sim. But It always helps to just add some particles that fake movement like that. That’s all right, but don’t forget that the game is pretty old. Sure, for actual high-end-fx you should offer more features like you said. But it’s the other way around, i don’t see brilliant particle tech (like in CoH) in many games and most engines just cover the basics of particle systems – without any/much advanced technology. However I’d like to note that there is a clear distinction between how particle data is generated and the way those particles are represented in the game world. The core of the particle system creates raw data for each particle: position, rotation, size, color and so on. That data can be then used by different kind of renderers to create the final effect. A renderer can produce a lot of things: it could create camera facing quads mentioned in the article but also meshes (like an asteroid field), sound sources or even a crowd of animated characters. I have a hunch is that the body of the flame above is a particle system too using a quad strip renderer where each division of the strip is a particle: location and size based on the raw particle data. Thank you for the compliment and the comment! Certain effects definitely need more data: as you said the velocity vector is an important one, acceleration helps to control motion, a counter for counting collisions, an extra vector to pass down to the shader to be used in whatever manner, and the list goes on. A great way to dissect particle effects is diving into UDK’s stock content, but a lot can be learned from it.